Hidden Valley Inn & Reserve is a vacation in harmony with nature, a perfect place for spiritual renewal, respite and reflection. 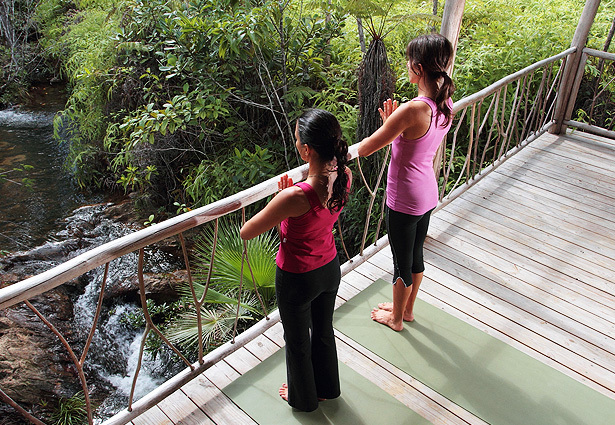 As such, we offer several retreat packages and specialized workshops for Yoga practitioners. On the Reserve, several 25x25 sq ft elevated Yoga platforms are located adjacent to the waterfalls and creeks and covered with rooftops. If you are a Yoga practitioner interested in coordinating a retreat, Hidden Valley Inn is happy to assist you in creating the perfect balance of class time with tours, expeditions, specialized menus and spa amenities that reflect the interests of your tour group. With a maximum capacity of 24 guests, we can easily accommodate your group in a semi-private or private setting. Hidden Valley Inn also hosts Yoga retreats with guest instructors. Please sign up for our newsletter, or check our website calendar of events to learn about any upcoming events.